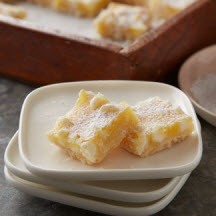 A buttery shortbread crust is topped with a lemon filling studded with white chips. Combine 1 cup flour and 1/4 cup granulated sugar in medium bowl; cut in butter with two knives until mixture resembles coarse crumbs. Press mixture onto bottom of 9-inch square baking pan. Bake 15 minutes or until lightly browned. Remove from oven; sprinkle white chips over top. Bake 15 minutes or until set. Cool slightly in pan on wire rack; sift powdered sugar over top. Cool completely in pan on wire rack; cut into bars.